Soup has probably been around since the beginning of time. I am not talking about the primordial soup in which the gran-gran-gran-…-parents of our molecules probably bathed before life began. No need to go that back in time. I am picturing a more recent and familiar scene: a prehistoric evening in a cosy little cave, some sort of container – perhaps a shell or a skull – rattling on a newly ‘invented’ campfire, fellow cavemen and cavewomen joining the prize of the hunting and gathering day to make some minestrone, while telling each other how their day was, by means of grunts, chest percussions and mural paintings. While my prehistoric fantasy might be a tad too wild (or not, who knows? ), what we know for sure is that soup can be tracked back to ancient history and before. According to The Food Timeline (a priceless reference for history of food), soup could be in fact the first recipe in human history, its appearance dating back to Palaeolithic times, around 10000 BC, together with flour and bread. This may not be a big deal for peoples that don’t mind living off sandwiches, but believe me, as an Italian I can be anything but grateful to the fellow (proto-) human being who, no less than 12000 years ago, came up with the life-changing invention of the warm meal. Soup in Thefoodtimeline.org. The website was started in 1999 by Lynne Olver, reference librarian and food historian. 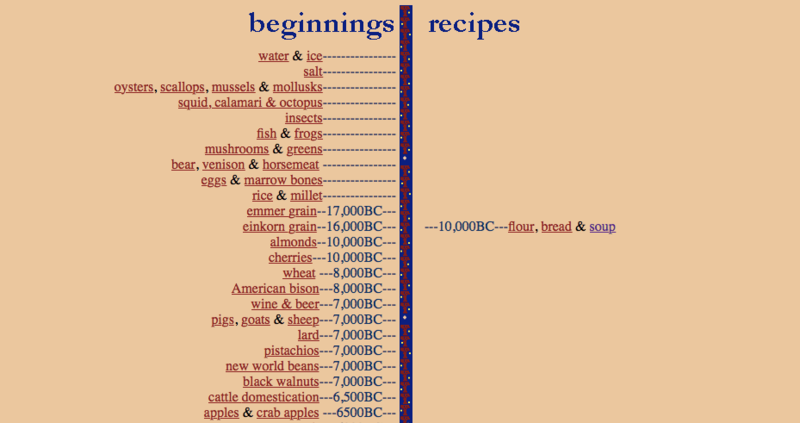 So let me gloss over roughly roasted meat (which is anyway off my menu, as a vegetarian) and state that the history of cooking starts with a bowl (or any other hollow object available) of soup and its loyal companion, bread. Varieties of soups, including broths, stocks, stews, creams, porridges, consommés and the like can be found in any cuisine across the five continents. Just try to Google “soups from around the world” and let me know where you end up sipping your meal. Soup seems to be one of those transcultural universal elements, like language, music, tales or friendship. As such, it inspires a sense of cosiness, care, home, comfort and warmth. Soup is a typically nutritious food, as well as a classic recovery recipe. It provides comfort with no hidden catch nor regrets. It’s something you can trust – your grandma would make it for you when you need to get back on your feet – something rich and wholesome but easy to digest. This blog takes inspiration from soup: the intention would be to toss in the right mix of ingredients, some substance, stories, warmth and cosiness. I can’t guarantee it will deliver the same pleasure of warm delicious soup, but I promise I’ll make it “as soup as possible”. Disclaimer: this blog might one day become a bike-powered soup delivery service. Meanwhile, I hope you enjoy the read.